This post is inspired by an email we received regarding gas logs. With just about everything in plumbing there’s a process to finding out what will work for you and your home. First you will want to figure out if you need a vented or non-vented unit. A vented unit should only be considered if you have a functional fireplace. The best person to determine the functionality of your fireplace would be a chimney sweep. When considering a non-vented option it is best to pick one with an O2 depletion sensor. Gas logs come in different sizes, flame patters, log styles, etc. Before you get your heart set on a particular style or look you need to measure the width and depth of the fire box. Once you have determined a size, then you can start checking out all the different options available. Photo taken from Chimney Mischief’s home page. One other thing to keep in mind is that if you are retro fitting an old fireplace, your most economical option is a set that has its own ignition. These units utilize one gas supply into the firebox. *Home Depot/Lowes only sell these units seasonally and do not offer experts on the subject. *Hearth & Patio sell these units year round and they provide expert help choosing a unit. Do you have an old coal burning fireplace? Don’t you fret. They have gas coal fireplaces too! Check out this bad boy! How much will it cost to install one of these fancy gas fireplace options? Well, a plumber will need to come out and give you an estimate because there are several factors that will determine installation cost but we can tell you that it will be no less than $500. If you have any further questions regarding Gas Logs, please feel free to give us a call. The question..To buy, or not to buy? Hellman’s or Dukes, or, would you go with the store brand? Amazon or Ebay, or would you just never purchase your shoes online? I’m pretty sure you make these decisions regularly. The push for the convenience of on-line shopping, coupled with the perceived value of saving money (how’d they do that?) ordering online, has everyone flocking to Amazon, Bonanza, Yahoo, and Google, to name an extreme few, for purchases as far and wide as your imagination will take you. I do it as well..for certain products. I just cannot buy a pillow I haven’t squeezed, or a chair I haven’t sat in. I also will not buy YOUR plumbing faucets, fixtures, and parts from some obscure online re-seller; and you should be extremely careful before you do. The internet has brought the entire world’s plumbing options to your mailbox. Unfortunately, not all fixtures and faucets are created equal and if I don’t impart the wisdom of the ‘other side’, you’ll be swayed by ‘Oh, how pretty, and look! Free Shipping!!’. #1 There are about as many faucet options out there as there are Cheerios in an institutional sized box. I’m guessing; I don’t really want to count them, but trust me, there are. #2 Plumbing manufacturers took their cue from car manufacturers. Almost nothing is standardized, universal, or as simple as it sounds. They all compete to make theirs just a little bit different so that a universal part only works if you have a late 1977-early 1978 model; maybe. #3 Plumbing codes vary from coast to coast. Federal standards and mandates trump all. If you purchase a fixture or faucet and it’s not compliant, we cannot install it, and you have to go through the trouble of returning it. I mention this because for at least 2 years after 1.6 gallon per flush toilets were illegal, they still showed for sale, online, at your orange and blue home centers. Who wouldn’t want a 600.00 TOTO toilet for 150.00? Anyone..unless it’s no longer legal to install them and they’re left with a 150.00 planter the neighbors may complain about. **Before you ask, please understand..These folks are selling all over the world. The internet allows them to do that. Which is great- for them. And that’s why ‘they’ can still offer for sale what is not legal to be installed here. There’s no law against selling or buying..only for installing. #4 Even with some of the large name brand manufacturers, if you don’t make your purchase from an authorized re-seller (you can check the manufacturer’s website), you can compromise your warranty. Going from a lifetime warranty to a year, or not at all, is major, considering the cost of replacement. More plastic parts, less stringent quality control; after all, the odds are, with your one faucet purchase, you may get a decent one. But how would you know? Just so you’re aware, we, as professionals, have no access to parts for retail line faucets. If something isn’t right, you’ll need to refer to the manufacturer for parts. #6 When we quote you a price to install your parts, that price covers only the initial installation. It does not include tearing apart a newly installed faucet to try and figure out why it’s leaking. It does not include waiting around while you run out to dig up missing parts or a different faucet altogether. And it does not include removing the newly installed faucet for repackaging, reinstalling your old faucet, if possible, so you aren’t left without, and returning to reinstall when Amazon comes with the replacement. I don’t mean for any of this to sound harsh, but it is the reality. If anything goes wrong with a fixture or faucet you purchase from us, within our warranty period, we will take the hit and fix or replace it. (Even if outside our warranty period, if we sold it to you and there is a manufacturer’s warranty to be had, we’ll do all we can to get your parts for free and only charge you labor). We’ll go through whatever scramble we need to go through to stand behind it; after all, you paid us for that and deserve it. If you purchase it elsewhere, we can’t reasonably, or in all fairness, stand behind it; it’s not ours. So..you know I saved the best for last. Drum roll, perhaps?? #7 IF, after knowing all the drawbacks of buying online you still cannot pass on ‘OMG, this is the coolest faucet I’ve ever seen! !’, then it is imperative that you retain as much information on your purchase as possible. Manufacturer, model, finish, color, website you purchased from, purchase date, a copy of your invoice, even whatever paper work came with the faucet. One or two of these things may not be enough. You need to keep all of it. Put it in a Ziploc and tape it inside the closest cabinet if you don’t maintain a house binder. This is because if we cannot identify it, we cannot repair it. It will cost two fortunes to try and hunt down parts from pictures you may email us (Google image finder isn’t as accurate as it may seem and it takes a long time to dig through the Cheerio box for just the right toasty-O). We, as plumbers, have a tendency to judge how good a faucet is by the availability of its repair parts. We know, as I’m sure you do, that anything mechanical can fail. If parts are readily available, we all save time and money. If not, it becomes a study in frustration; for all of us. Oh,,that brings up one more small point. Lets call it #7A. #7A IKEA does not have repair parts, at all, available for any of their faucets. They are happy to replace the whole unit if you bring in the defective one- provided it’s still available and under warranty. Remember we’ve already established that labor costs make this option non-cost-effective (or however you’d say that), so just keep that crap-shoot game in mind if you turn off your web browser and decide to spend a day following the yellow line (See?? I’ve spent lots of time at IKEA myself, and I know all the shortcuts to get my little one back to the bathrooms with a quickness!). I should say something profound to conclude, like ‘Caveat Emptor’ but that sounds a little ominous. Shopping should, instead, be filled with happy little emojis. I will say to please feel free to give us a call if it gets confusing or overwhelming and we’ll try and help you navigate the shark-infested waters of online plumbing shopping. How NOT to unclog a sink! I skim through Facebook and Twitter everyday in search for funny plumbing memes and helpful plumbing tips that I don’t have to write up myself (“ain’t nobody got time fo dat”). One of our Twitter followers posted something they thought would be helpful and I cringed when I saw what it was. 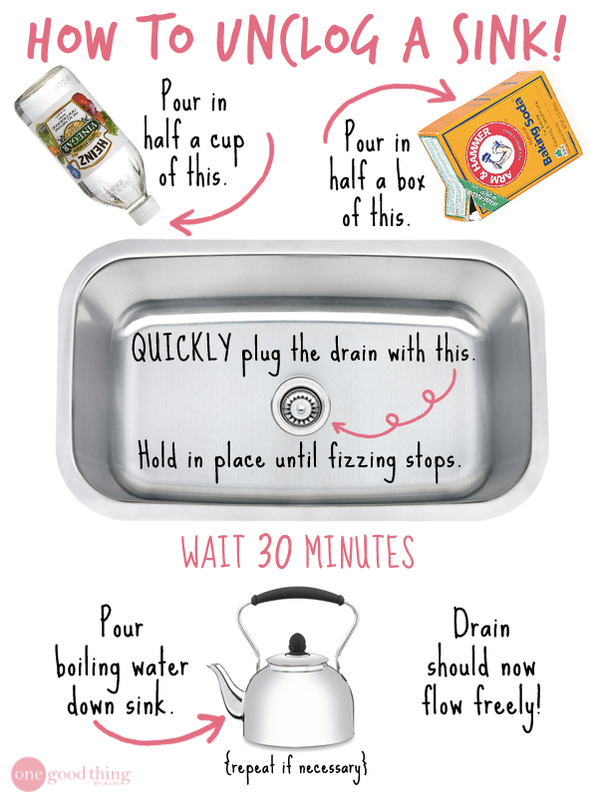 The post stated “How To Unclog A Sink Without Chemicals! After clicking the link I was shocked, dismayed, and appalled. I have renamed this picture- how NOT to unclog a sink. Vinegar and Baking Soda are indeed chemicals. You may not think of them as chemicals, but they most certainly are. Vinegar is acetic acid and baking soda is sodium bicarbonate. When these two chemicals combine, they fizz like crazy. Just add some red food coloring and you have yourself a volcano for your child’s science fair. Still involves the chemicals mentioned above. So we have an acid and a salt. A lot of drains, especially here in Atlanta, are made of cast iron. If you are familiar with cast iron skillets, you know that salt is helpful when cleaning them, but its not necessarily the best thing to be sitting in your drains. Acids, as you may know, are never a good idea in your cast iron pan, but an especially bad idea in your drains. Acids and salts will speed up the corrosion process of your cast iron drains and has virtually no effect on plastic drains at all. Save that baking soda and vinegar for the science fair, folks. So how do you unclog a drain without chemicals? I’ve created a short and sweet video to show you how its done. © 2019 M. Cary & Daughters Plumbing.